DO-91210-30 was succesfully added to your cart. The rugged ABS construction makes this meter shock-resistant, and is gasketed in order to seal out dirt, dust, fumes and water. Perfect for use in lab or plant environments. A microprocessor updates the display twice every second. The meter features recall, min/max, Hold, °F/°C selectable units, count-up timer, and high/low alarm. 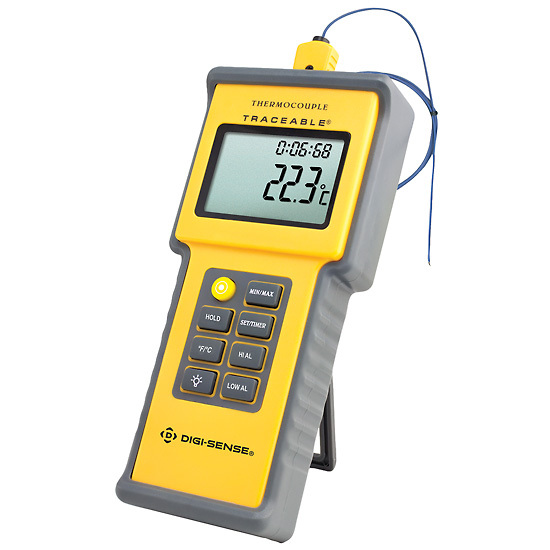 Accepts type K thermocouple probes with miniconnector. Back-lighting button permits reading in dark areas. Resolution The resolution is 0.1F (0.1C) between -199.9 to 1369.9 C/F; it is 1C/F resolution outside of this range. A digital copy of the user manual is available. I will email it to you. This unit updates the reading twice a second. If you need to know the time it takes to give an acctual reading, it would depend on the change between its initial and final temperature. Please contact our technical application specialists for additional assistance (contact information can be found on the product web page). We have two of these units. We use them in ovens and freezers. They work well for us and they are tough. The only down fall was the most recent one we purchased had dead batteries. I bought two thermometers like this and I returned both for bad operation. After couple weeks of using the thermometer, the display started showing low temp readings. So I question its accuracy and proper calibration. Merchant response: We are sorry to hear of your disappointment with this product. We have reviewed our product quality logs and have no other reported issues with this item. I wish Coleparmer would bring back the Digi-sense, model 91100-10, thermocouple. The 91210-30 model does not always calibrate to our standards, right out of the box. I spoke to an associate in the technical group at Coleparmer, and purchased a recommended thermocouple. That unit was even worse. The 91210-30 unit is the only one I have found since the replacement of the Digisense thermocouple that will calibrate to our standards. The results of a majority of those purchased units are poor at best. Merchant response: We are sorry to hear of your disappointment with this product. Please note - we do have a replacement for the Digi-Sense you mentioned, see product 91427-10. QA Dept. I have to assume that this is properly calibrated because I have no way of verifying other than rough estimates based on observation. I would recommend buying some additional wire as this model only came with a few feet which can wear away quickly. The unit was not assembled with the O-ring gasket for the case. Moisture from our autoclave follows the K probe into the unit. Always purchase Cole Palmer thermometers. They are one of the best out there.